1891 Canada Census, Lot 18, Prince County, Prince Edward Island. Household of Duncan Bearisto/Beairsto, his wife Joanna Wallace, their children Lucy, Amelia, Esther, Bertha, William and Charles. 1901 Canada Census, Lot 18, Prince County, Prince Edward Island. Household of Duncan Beairsto, his wife Joanna Wallace, their children Lucy, Amelia, Esther, Bertha, William, Charles, Minnie and James. 1911 Canada Census, Lot 18, Prince County, Prince Edward Island. Household of Duncan Beairsto, his wife Joanna Wallace, their children Esther Grace, Bertha May, William Preston, Charles Frederick, Minnie and James. Burial* He was buried in Peoples Cemetery, Malpeque, Prince County, Prince Edward Island, Canada, 46.52981,-63.68771 . 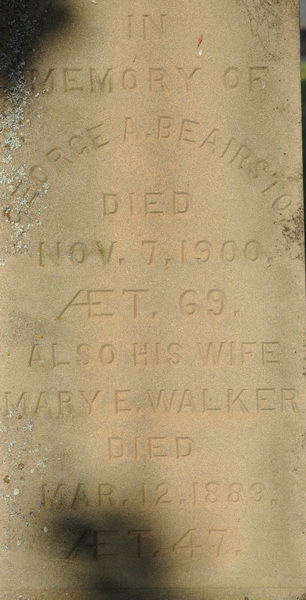 Tombstone, William James Beairsto (1888-1985), his wife Kate Champion (1887-1970), their grandson Preston S. Beairsto (1938-2006). Peoples Cemetery, Malpeque, Prince County, Prince Edward Island, Canada. [S7730] Baptism transcription - William Preston Bearisto, , PARO Baptismal Index, United Church, Margate, Prince Edward Island, Book 2, Page 42-43, (9 January 1889). Hereinafter cited as Baptism transcription. [S4410] 1901 Canada Census - Duncan Beairsto, Household #164, 31 March 1901, Microfilm T-6510, Lot 18, District #133, Sub-district d-1, Prince County, Prince Edward Island, District Number 133, Subdistrict Number g-1., Library & Archives Canada, 395 Wellington St., Ottawa, Ontario, Canada, Library & Archives Canada. [S10937] Death - John A. Cousins 1942-2016, Davison Funeral Home, Kensington, Prince County, Prince Edward Island, Canada. [S11641] Cemetery Marker, Peoples Cemetery, Malpeque, Prince County, Prince Edward Island, Canada, Preston Beairsto & Kate Champion photograph & inscription; read by David A. Walker, 4 July 2016. [S7741] 1891 Canada Census, of Duncan Bearisto Household #38, 11 April 1891, Microfilm LAC Microfilm T-6383, Page 9, Lot 18, Prince County, Prince Edward Island, Library & Archives Canada, 395 Wellington St., Ottawa, Ontario, Canada, Library & Archives Canada. [S8529] 1911 Canada Census - Duncan Beairsto, Household #43, 12-13 June 1911, Microfilm LAC microfilm T-20326 to T-20460, Lot 18, District #140, Prince County, Prince Edward Island, Library & Archives Canada, 395 Wellington St., Ottawa, Ontario, Canada, Library & Archives Canada. [S8815] Tombstone, Peoples Cemetery, Malpeque, Prince County, Prince Edward Island, Canada, William Preston Beairsto marker inscription; read by David A. Walker, 16 August 2013. [S10942] 1921 Canada Census, Indian River, Prince County, Prince Edward Island, of Duncan Beairsto Household #18, digital copy of original document Library & Archives Canada, Reference Number RG 31, Folder Number 104, Census Place: Indian River, Page Number 3, Library & Archives Canada, 395 Wellington St., Ottawa, Ontario, Canada, Library & Archives Canada. 1881 Canada Census, George A. Beairsto, wife Mary Eliza (Walker), son William and daughter Emma. 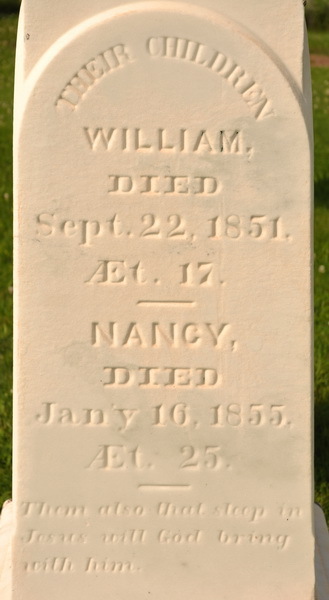 Burial* He was buried in Peoples Cemetery, Summerside, Prince County, Prince Edward Island, Canada, 46.40570,-63.77745 . Square sandstone obelisk. Inscription: In Loving / Remembrance / William Scott / Beairsto / Died June 21, 1911. / AET. 37. / Also His Son / Otto Scott / Died May 9, 1910 / AET. 3 Yr. 7 mos. / BEAIRSTO. Right: Gone Home / Otto Binns / son of George A. 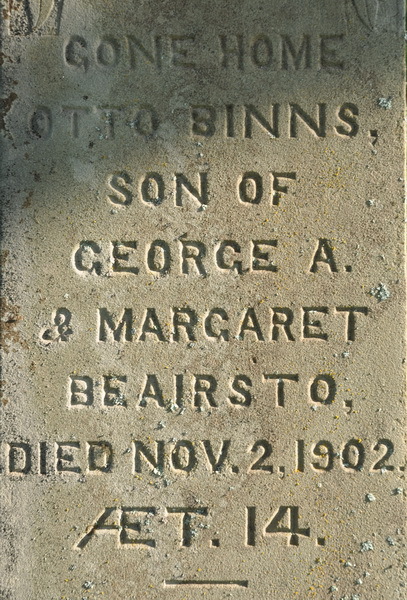 / & Margaret / Beairsto, / Died Nov. 2, 1902 / AET. 14. 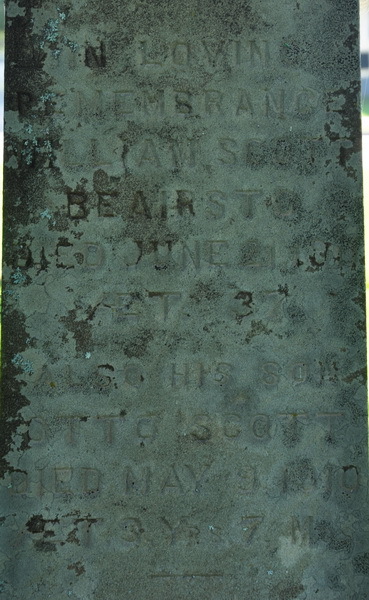 Tombstone for William Scott Beairsto ( (1874-1911) and family. Peoples Cemetery, Summerside, Prince County, Prince Edward Island, Canada. [S3780] 1881 Canada Census - George A. Beairsto, George A. Beairsto Household #379, 4 April 1881, Microfilm Microfilm C-13162, Page 85, Line 10, Summerside, District Prince, Subdistrict Q, Library & Archives Canada, 395 Wellington St., Ottawa, Ontario, Canada, Library & Archives Canada. [S3779] Cemetery Marker - William Scott Beairsto and family, William Scott Beairsto and family Marker Inscription; David A. Walker, 22 August 2009. [S3788] Karin Allan & Dave Hunter, online http://www.islandregister.com/beairsto.html. (The Island Register web site). [S13916] 1911 Canada Census, Summerside, Prince County, Prince Edward Island, of W.S. Beairsto household #79, 9 June 1911, digital copy of original document Library & Archives Canada, Ottawa; Census Place: Summerside, Prince County, Prince Edward Island; Microfilm reels T-20326 to T-20460, Page 8, Library & Archives Canada, 395 Wellington St., Ottawa, Ontario, Canada, Library & Archives Canada. 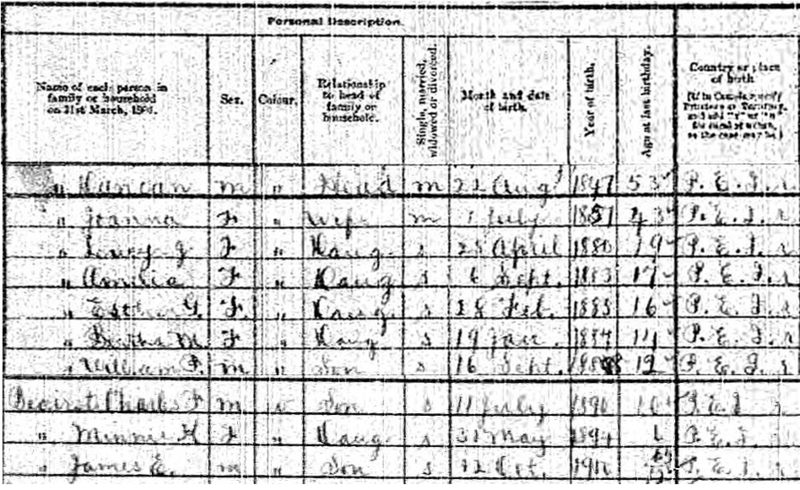 1920 US Census - household of Hammond J. Beals, his wife Nettie (Cushing), and their sons Ralph & Ashley. Rockland, Plymouth County, Massachusetts. 1930 US Census, household of Ashley Beals, his wife Ethel Aitken, and daughters Lorraine & Madeline/Madelyn. Rockland, Plymouth County, Massachusetts. [S4471] 1920 US Census - Hammond J. Beals, Household #240: Hammond J. Beals, Microfilm Roll T625_727, Page 16A, Enumeration District 141, Image 678, http://www.ancestry.com, Ancestry.com. [S4472] 1930 US Census - Ashley S. Beals, Household #269: Ashley S. Beals, 14 April 1930, Microfilm Roll 941, Page 10B, Enumeration District 97, Image 138.0, http://www.ancestry.com, Ancestry.com. [S129] Ross Graves William Schurman Loyalist of Bedeque Prince Edward Island and His Descendants, Vols. 1 & 2 (Summerside: M.F. Schurman Co. Ltd., 1973), pages 201. Hereinafter cited as William Schurman Loyalist of Bedeque. Child of George Beals and Mary Ann ? [S4469] Baptismal Index, PARO, Charlottetown, P.E.I. - Baptismal Record - James Douglas Beals, , United Church , Cornwall, Queens County, Prince Edward Island, Book 3, p. 5, (14 May 1859). Hereinafter cited as Baptismal Index, PARO, Charlottetown, P.E.I. - Baptismal Record - James Douglas Beals. 1930 US Census, household of Norman Beals, his wife Alice, and son William. Rockland, Plymouth County, Massachusetts. [S4473] 1930 US Census - Norman J. Beals, Household #270: Norman. Beals, 14 April 1930, Microfilm Roll 941, Page 10B, Enumeration District 97, Image 138.0, http://www.ancestry.com, Ancestry.com. [S4470] Baptismal Index, PARO, Charlottetown, P.E.I. - Baptismal Record - Sarah Emeline Beals, , United Church , Cornwall, Queens County, Prince Edward Island, Book 3, p. 5, (30 October 1859). Hereinafter cited as Baptismal Index, PARO, Charlottetown, P.E.I. - Baptismal Record - Sarah Emeline Beals. Child of Thomas Beals and Lou ? [S8507] William Beales & Eliza Strang, , Prince Edward Island Marriage Book, Marriage Book 1856-1863 , #7, page 19. Hereinafter cited as Prince Edward Island Marriage Book. [S129] Ross Graves William Schurman Loyalist of Bedeque Prince Edward Island and His Descendants, Vols. 1 & 2 (Summerside: M.F. Schurman Co. Ltd., 1973), pages 95. Hereinafter cited as William Schurman Loyalist of Bedeque. [S1117] Sr. Ronald Paul Andring, "Ronald Paul Andring, Sr., compiled records", Donald R. Coy, recipient (Walla Walla, Washington, U.S.A.). . Hereinafter cited as "Ronald Paul Andring, Sr., compiled records." [S1003] Collected by Edward Hiram and Evelyn Mae (Nilson) Mahoney, compiler, Mahoney Family Ancestry & History : self published). Hereinafter cited as Mahoney Family Ancestry & History. [S1003] Collected by Edward Hiram and Evelyn Mae (Nilson) Mahoney, compiler, Mahoney Family Ancestry & History : self published), MAHONEY FAMILY ANCESTORY,HISTORY, collected by Edward Hirum & Evelyn Mae (nee Nilson) Mahon Donald R. Coy, 1993. Hereinafter cited as Mahoney Family Ancestry & History. [S1126] Georgia Marlene (Burton) and James Curtis DeLung, "Georgia Marlene (Burton) and James Curtis DeLung, compiled records", recipient, Donald R. Coy (Salem, Roanoke County, Virginia, U.S.A.). . Hereinafter cited as "Georgia Marlene (Burton) and James Curtis DeLung." [S1398] , vol.34, Daughters of the American Revolution Lineage Books, 152 vols., online Ancestry.com. Previously published in hard copy (Provo, Utah, U.S.A.: The Generations Network, Inc.). Hereinafter cited as "Daughters of the American Revolution Lineage Books." [S7151] Correspondence with John Marsh Personal Archives of David Arthur Walker. [S7728] Baptism transcription - Amelia Helena Bearisto, , PARO Baptismal Index, St. Mary's Roman Catholic Church, Indian River, Prince Edward Island, Book 1, Page 204, (29 January 1910). Hereinafter cited as Baptism transcription. [S4726] Baptismal Index, PARO, Charlottetown, P.E.I. - Baptismal Record - Robert Frederick McNutt, , United Church , Kensington (Princetown records), Prince County, Prince Edward Island, Book 1, p. 8. Hereinafter cited as Baptismal Index, PARO, Charlottetown, P.E.I. - Baptismal Record - Robert Frederick McNutt. [S7729] Baptism transcription - Mary Beatrice Bearisto, , PARO Baptismal Index, United Church, Margate, Prince Edward Island, Book 3, Page 112-113, (10 May 1899). Hereinafter cited as Baptism transcription. Descendants of John Stillwell Sr.
Burial* She was buried in North Bedeque Cemetery, North Bedeque, Prince County, Prince Edward Island, Canada, 46.361550,-63.726267 . 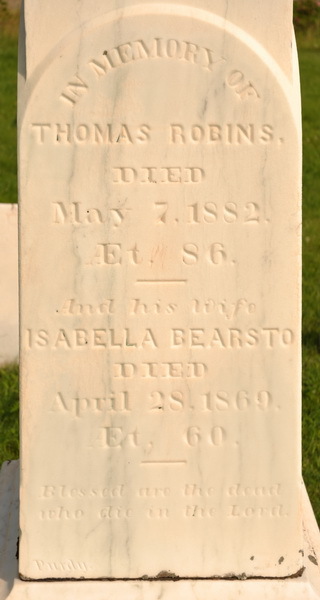 Tombstone for Thomas Robins ( (1796-1882), Isabella Bearsto (1809-1869), their children William and Nancy. North Bedeque Cemetery, North Bedeque, Prince County, Prince Edward Island, Canada. [S2430] Marker Inscription for Isabella Bearsto, Isabella Bearsto Marker Inscription for Isabella Bearsto; David A. Walker, 7 August 2006. [S2431] "Richard Robins, Loyalist", Mary (Wright) Bradshaw ; David Arthur Walker,. Hereinafter cited as "Richard Robins, Loyalist." [S4808] Descendants of Thomas Hooper (1539- ), online http://treena126.webs.com/stephenhooperfamily.htm. Hereinafter cited as Descendants of Thomas Hooper (1539- ). [S3863] Thomas Robins & Isabella Bearsto marriage, in Marriages Book, PEI, 1824-1831: PARO - Master Name Index Phase 2, PARO, Public Archives and Records Office of Prince Edward Island, Charlottetown, Queens County, Prince Edward Island, Canada, 46.23533,-63.12547. Hereinafter cited as Marriages Book, PEI, 1824-1831. [S2429] Marker Inscription, Thomas Robins Marker Inscription; David A. Walker, August 2006. [S2672] Marker Inscription, Thomas Robins (1796-1882) Marker Inscription; David A. Walker, August 2006. [S886] , Book 1, Page 11., North Bedeque United Church Records, North Bedeque, Prince County, Prince Edward Island, PARO, Public Archives and Records Office of Prince Edward Island, Charlottetown, Queens County, Prince Edward Island, Canada, 46.23533,-63.12547. [S2405] Marriages, Death & Funerals Baptisms, Baptisms, Page 12, North Bedeque United Church Records, North Bedeque, Prince Edward Island, North Bedeque United Church Records, North Bedeque, Prince County, Prince Edward Island, Canada. [S886] , Book 1, Page 12., North Bedeque United Church Records, North Bedeque, Prince County, Prince Edward Island, PARO, Public Archives and Records Office of Prince Edward Island, Charlottetown, Queens County, Prince Edward Island, Canada, 46.23533,-63.12547. [S886] , Book 1, Page 17., North Bedeque United Church Records, North Bedeque, Prince County, Prince Edward Island, PARO, Public Archives and Records Office of Prince Edward Island, Charlottetown, Queens County, Prince Edward Island, Canada, 46.23533,-63.12547. [S3631] Index to County Birth Registers - Laura Grace Davis, Laura Grace Davis, Microfilm Microfilm F14026, Code 10-3-163-11799 (1897), Provincial Archives of New Brunswick, Fredericton, York County, New Brunswick, Canada. [S3633] William James Davis & Maggie Catherine Beasley marriage, 16 Oct. 1889, Personal Archives of David Arthur Walker, Edwards, Ontario, Canada. PANB F13388, Ref. B2c, Number 56. [S2354] Fulton Underhay, online http://www.islandregister.com. (PEI), downloaded May 2006, Page 102. [S11963] Cemetery Transcript, Mount Stewart, St. John's United People's Cemetery, transcription, Personal Archives of David Arthur Walker, Edwards, Ontario, Canada. [S373] Correspondence with Gary Leighton Townshend . Personal Archives of David Arthur Walker (Edwards, Ontario, Canada). [S373] Correspondence with Gary Leighton Townshend . Personal Archives of David Arthur Walker (Edwards, Ontario, Canada), electronic GEDCOM, 10 Jul 1999, QUAY 1. [S790] Lansing, Michigan, Michigan Department of Vital and Health Records. Michigan Death Index, Lansing, MI, 1971-, Ancestry.com, http://www.ancestry.com, Death Certificate # 10320, QUAY 2. Hereinafter cited as Michigan Department of Vital and Health Records. [S373] Correspondence with Gary Leighton Townshend . Personal Archives of David Arthur Walker (Edwards, Ontario, Canada), 'Oultons in America 1995' descendancy charts, QUAY 1. [S3347] Obituary - Lillian Mae Beaton, Moase Funeral Home, Summerside, Prince Edward Island12 November 2008. Burial* She was buried on 14 November 2008 in Peoples Cemetery, Summerside, Prince County, Prince Edward Island, Canada, 46.40440,-63.77538 . The funeral was held at North Bedeque United Church. Tombstone, Keir D. Marchbank (1912-1982), his wife Lillian M. Beaton (1915-2008). Peoples Cemetery, Summerside, Prince County, Prince Edward Island, Canada. [S7941] Wayne Seymour Marchbank & nancy Ann MacInnis marriage, 9 September 1961, in Book #3, Marriage Register 1959-1975, North Bedeque United Church Records, North Bedeque, Prince County, Prince Edward Island, Canada. Hereinafter cited as Marriage Register. [S7945] Robert James FArris & Doris June Mae Marchbank marriage, 26 April 1962, in Book #3, Marriage Register 1959-1975, licence # 3812, North Bedeque United Church Records, North Bedeque, Prince County, Prince Edward Island, Canada. Hereinafter cited as Marriage Register. [S11298] Death Notices, Moase Funeral Home, Summerside, Prince County, Prince Edward Island, Canada. [S3348] Cemetery Marker - Keir Marchbank, Keir Marchbank Tombstone Inscription; David A. Walker, 17 August 2010.